A chicken biryani recipe made with tender chicken on bone, saffron, cashews and long grain basmati rice. So good! Who isn’t familiar with chicken biryani? Only someone living under a rock! The online space is full of one chicken biryani recipe after another. Just type in the phrase in Google and see the sheer number of results that the search engine spits out. It’s startling. Like all things very popular, there are countless variations, and needless to say, all of them are not good. To eat ho-hum biryani is quite a drag, so it’s nice to know a few facts about it. Here goes! To the old khansamas (chefs) of North India, it would be nothing short of blasphemy to add ingredients like potatoes, tomatoes, turmeric (ugh!) or even too much spice in a biryani recipe. These ingredients alter the very nature of biryani, and if I may go so far, corrupt it. And yet, I have suffered through one overly yellow, impossibly hot, potato filled disaster after another in my biryani eating adventures! I don’t know the reason why these versions have become so ubiquitous, but I do know that I prefer biryani the way it was made through the ages in the kitchens of North India: a delicately spiced rice and meat preparation with loads of flavour and taste. Here, I share with you my chicken biryani recipe that I have perfected over the years. And if you’d rather have a mutton biryani, simply sub the chicken for mutton. Only, cook it longer so that the meat becomes tender. If I’m making mutton biryani, I always cook the mutton in a pressure cooker. And that brings me to my second point. I can’t stress this enough … you must use the best quality Basmati rice you can find to make biryani. 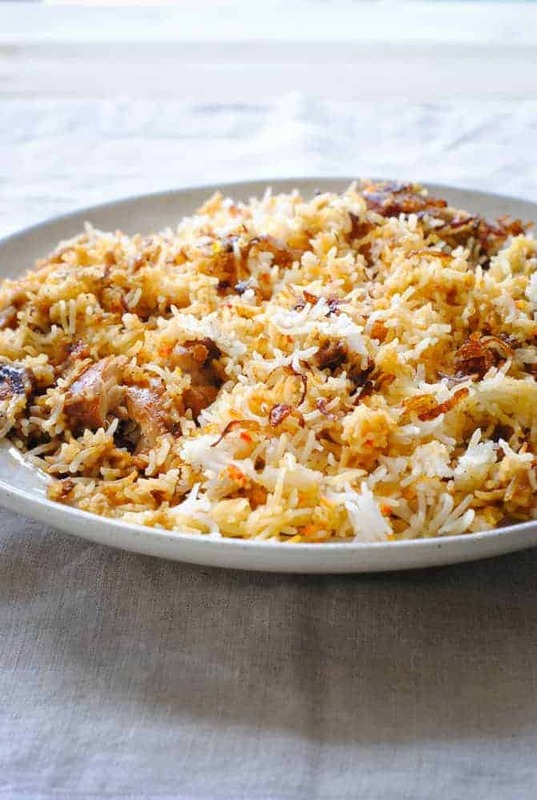 If you make biryani with sub-par rice or any rice other than Basmati, you won’t be doing justice to this king of dishes. I use Tilda (no affiliate links) because it is the most fragrant, long-grain Basmati rice I can find in the market. 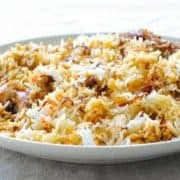 A special note about my chicken biryani recipe: I have added just a pinch of orange food colour (a very small pinch) to my biryani, but you can skip it altogether. Yes, biryani looks very pretty with those fiery red streaks, but the fact remains that food colour is an artificial ingredient and I am leery of it. The maximum I will add is a few grains and not more. The solution? I colour my biryani with saffron dissolved in a little milk. Good quality saffron adds a suffused orange-ish tinge to the rice. Your biryani will not look so flamboyant, but it’s a much better choice than food colour. Just don’t go overboard with the saffron because it has a very distinctive fragrance and taste too. You don’t want a biryani that’s too saffrony. 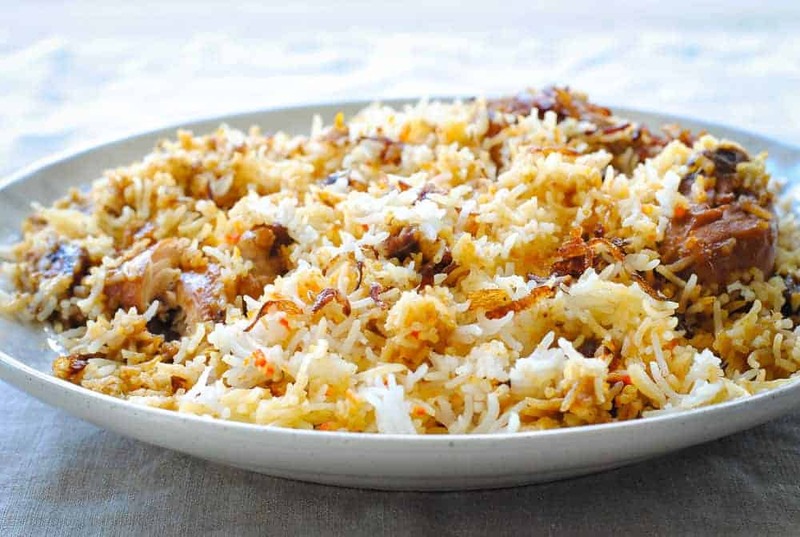 Ready to give the most awesome chicken biryani recipe a try? Let’s go! In a dutch oven or deep pan, fry the finely sliced onions in oil until reddish brown. Add cumin seeds and stir. Add pureed onion, ginger-garlic paste, coriander and Kashmiri chilli powders, Shan Sindhi Biryani Masala. Cook this mixture for 5-7 minutes, adding yoghurt 1 tablespoon at a time in between. Keep stirring the masala throughout. Add chicken and cook until the oil separates and the chicken is tender. Keep adding splashes of water to keep the gravy from burning (25-30 minutes). The gravy should be thick and shiny when the chicken is done, not watery. While the chicken is cooking, take around 12 glasses of water in a large pot and set it on high heat. Add salt and whole spices. When the water starts boiling, add rice and cook until the rice is 80% done (al dente). Drain the rice in a colander and discard the water and whole spices. In a heavy-bottomed, deep and wide pot (it could be the same one in which you boiled the rice), spread half the rice at the bottom. Then, spread the cooked chicken in a layer above the rice and top with the remaining rice. Fry cashews (if using) in oil until light brown and add them to the biryani. Reserve the oil. Fry onions in the same oil as above until they are reddish-brown and pour immediately over the biryani. Pour the saffron-infused milk over the biryani. Sprinkle the food colour on top of the rice, if using. Cover the pot with a lid and set it on the lowest heat possible for 15-20 minutes. Take off the lid and with the help of a wide spoon, gently mix the rice and meat together. Your chicken biryani is ready to be served now! Shan Sindhi Biryani Masala and Tilda rice (no affiliate links) are available at any Indian or Pakistani grocery shop or the international aisle of major supermarket chain like Walmart. If you can’t find Shan, any biryani masala will do. I have a personal preference for Shan. It is important to assemble the biryani in a large enough pot as mentioned earlier in step 7 above because the rice needs space to bloom. If the pot is smallish and the rice and chicken are crammed in, the rice will break and the biryani will look smushed. If you don’t want to go to the trouble of removing the whole spices from the cooked rice by hand (step 6), take the spices in a square piece of cheesecloth and tie the ends firmly. Immerse this bag in the pot of water at the same time as you add salt. Simply remove the bag once the rice is done and ready to be layered. The rice would have absorbed the flavours of the spices just as well. Serve the biryani with raita (cold yoghurt with dry roasted and ground cumin and salt) for a truly lip-smacking combo! I very much look forward to trying this. 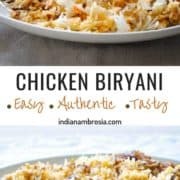 Ive never made biryani before, and this sounds like a great place to start! Yes, do try it. You won’t be disappointed, I’m sure! I am definitely making this soon. Thanks for the tips. Yum! Looks so delicious and perfect for a dinner party! I love chicken biryani! I always wondered what the heck is the so popular Chicken Biryani?! Thank you for your detailed insights, I really enjoyed to learn about your basic biryani-making principles. Love the fact that you skip artificial food color in this recipe and use a saffron mixture instead. Haha! Now you know what it is, do make it!